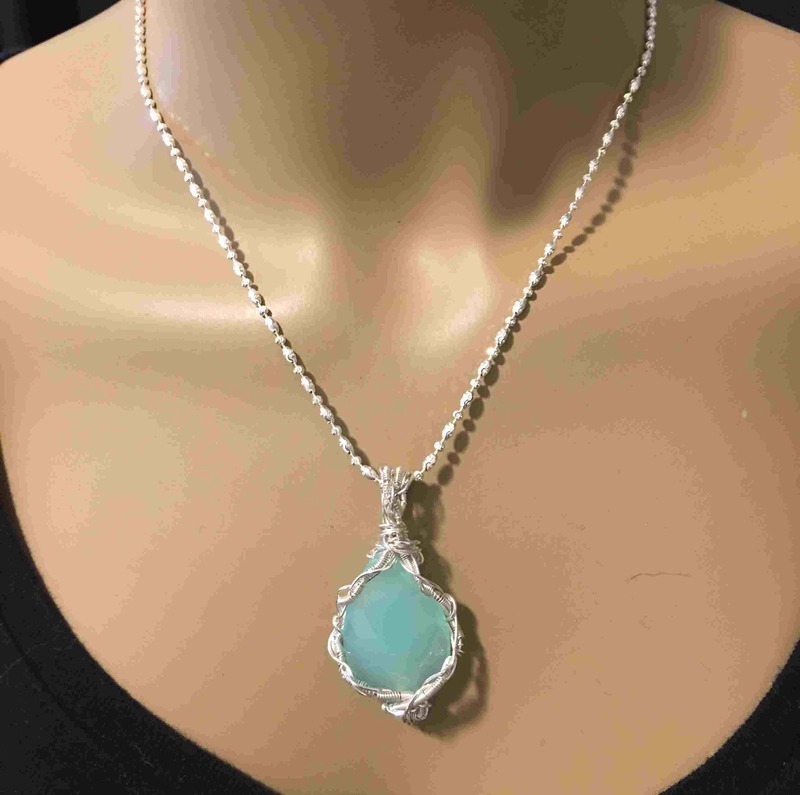 This is a stunning piece of faceted Aqua Chalcedony that I wrapped with woven sterling wire and it hangs from a 18" sterling chain. The pendant including the bail is 2" x 1". Chalcedony is a family of metaphysical crystal symbolizes goodwill and brotherhood. Aqua Chalcedony a member of the family. Due to its metaphysical properties, Aqua blue chalcedony has certain benefits that some of you haven’t heard before. The first thing that comes into the mind when hear about this crystal is its nurturing ability which is beneficial to create composure and calmness especially for those with issues. The crystal itself was already popular back in ancient times. It symbolize air and water deities and often associated with weather. But it is actually more than that. Fact shows that it can deliver multiple uses whether it is spiritually, emotionally and physically. Now, let’s reveal what it actually has. Are you trying to make connection with spirit world? 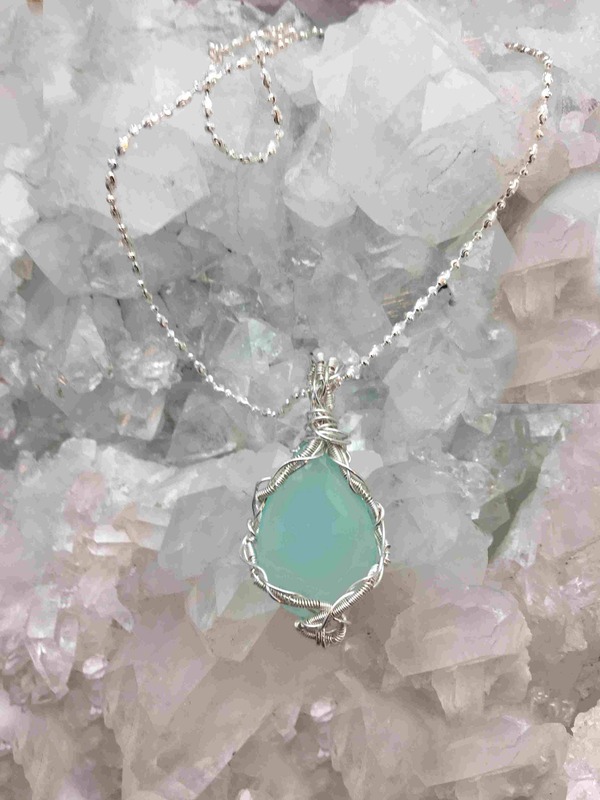 Aqua chalcedony is the right crystal to have. Since it was first used, it was already a usual tool to help create pathway to the spirit world and to receive successful transmissions. It ensures that the communication between people and those living in spirit world goes well. Aside from clear communication with the spirit world, it also helps during meditation to allow one to reach higher realms. It provides calmness and peace during the process. Lots of people have a problem with mental and emotional stability. This crystal is useful to help nurture stable mental and emotional state as well as nurture creative ideas. One can enjoy more enhanced responsiveness and receptivity while being able to assimilate new creative ideas. When the mental and emotional state is stable, it then creates an enthusiastic personal outlook which attract others’ attention. It’s all about positivity. All kinds of chalcedony crystals like green chalcedony and blue chalcedony stones hold useful property to help foster balance between the body, mind and spirit,as well as Aqua chalcedony. It reaches for aligned balance to allow one to enjoy true peace in his/her life. Since it helps to remove and block negativity, it is able to get rid of most any negative energy such as hostility, irritation, anger, obsession, and jealousy. Without these energies, our lives will be more peaceful. Meanwhile, as Speaker Stone, this crystal delivers more uses which include improving memory, imparting mental flexibility and achieving verbal dexterity. During the process, it encourages reflection, enhances communication and listening skills, stimulates the mind and prepares us for action. Each crystal has its own physical healing support as well as aqua chalcedony stone. Since it activates the Throat Chakra, it is able to help heal issues around the tonsils, neck, vocal cords and allergic reactions. It helps cure infections, open sores, fevers and inflammation. For one with sleeping issues, this crystal offers some help such as to protect from night visions, nightmares, sleepwalking and fear of darkness. 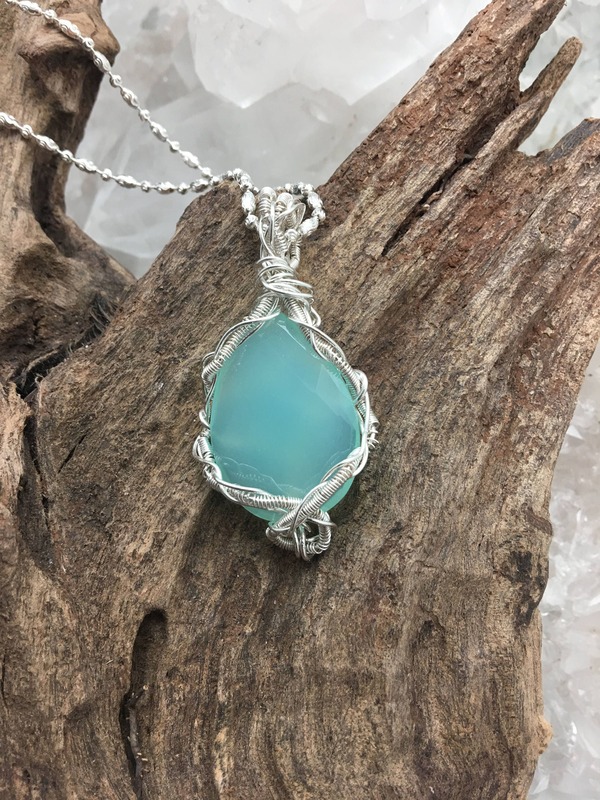 Furthermore, the healing properties of Aqua chalcedony also benefit emotions as it can help to cleanse ad purify the emotional state from any negativity that may include senility, dementia, obsessive thoughts, sadness, hysteria and fear.